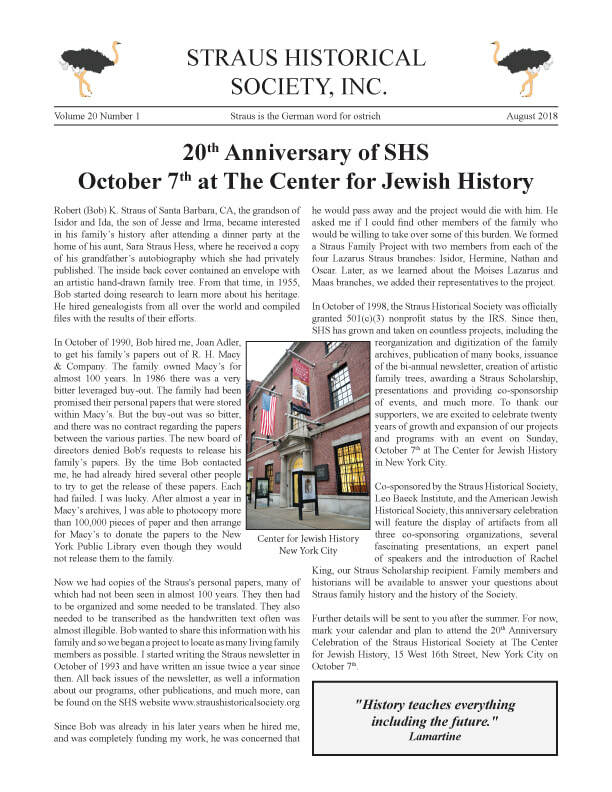 This newsletter contains an article about the upcoming 20th Anniversary of SHS, as well as articles about the Strauses and the Arts book and Silent Auction, Rachel King: The Straus Scholarship Winner, and Isidor Straus' Nomination for Congress in 1911. Smaller articles include LIU's Digitization Grant, the 70th Anniversary of Israeli Statehood, the Straus Family's Donations to the High Museum of Art, Straus Presentations, and News from Friends of Straus Park. 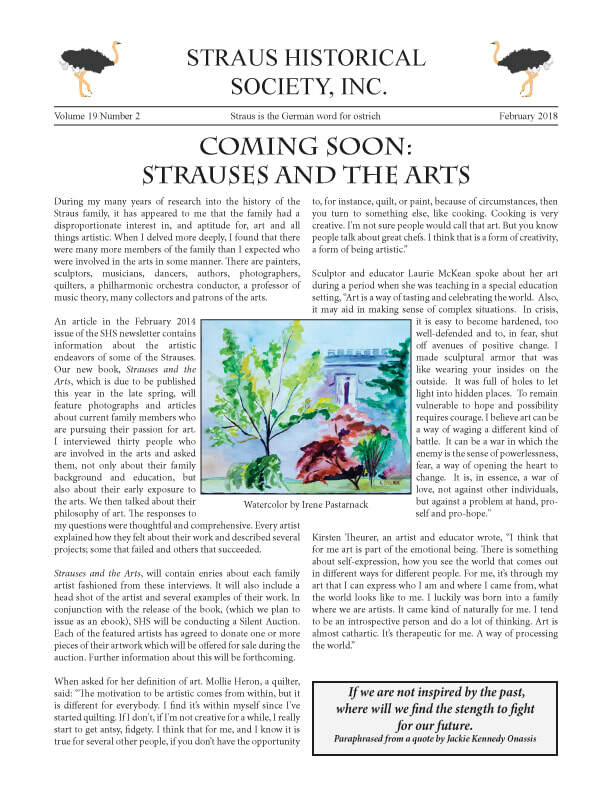 This newsletter contains an article about the upcoming book Strauses and the Arts, as well as articles about Titanamania, an article by Paul A. Kurzman about his interview with James Cameron, The SHS Scholarship Program, and The Straus Art Exhibit at the Museum of Fine Arts in Houston. Smaller articles include the Straus Presentations, and News from Friends of Straus Park. 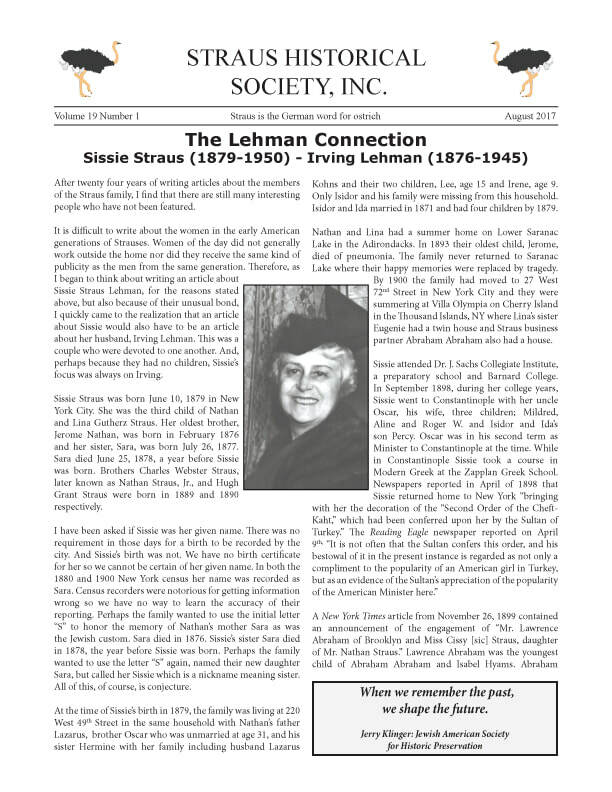 This newsletter contains an article about the Lehman Connection: Sissie Straus (1879-1950) & Irving Lehman (1876-1945), as well as articles about L. Straus & Sons, The SHS Scholarship Program, The Virtual Museum of Public Service and The Exhibit 1917: How One Year Changed the World. 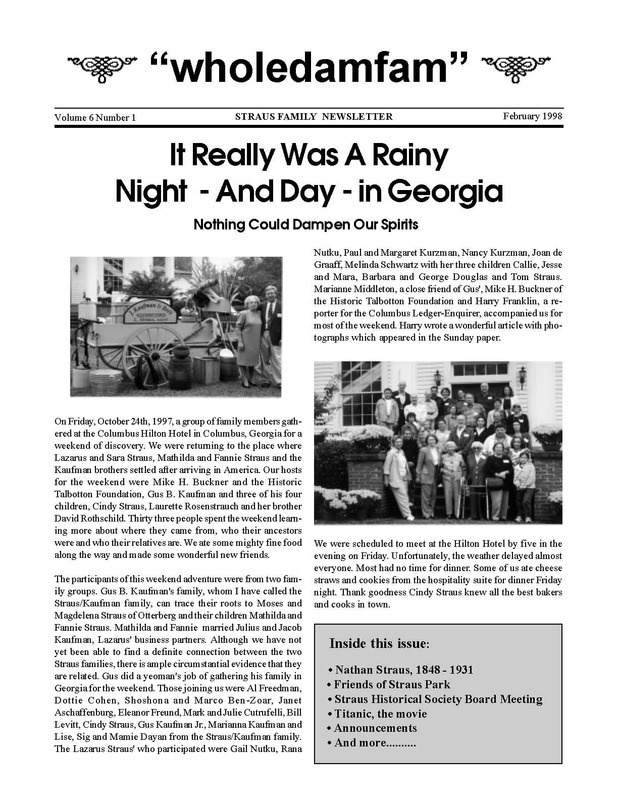 Smaller articles include The SHS Digitization Project, Straus Presentations, and News from Friends of Straus Park. 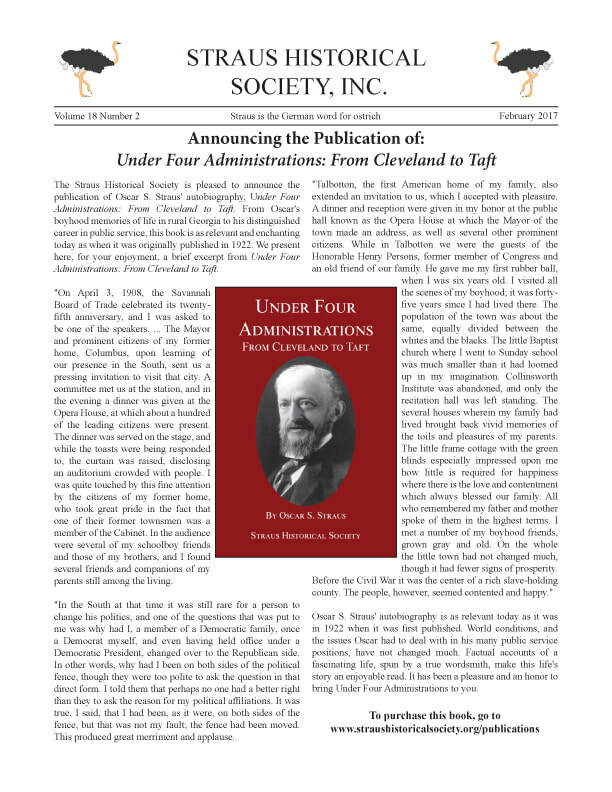 ​This newsletter contains an article announcing the publication of Under Four Administrations: From Cleveland to Taft, as well as articles about Lee Kohns, The Lemlich/Straus Connection, and Anniversaries in Straus Family History. Smaller articles include Exhibition News, Straus Presentations, Two Renovations, and News from Friends of Straus Park. 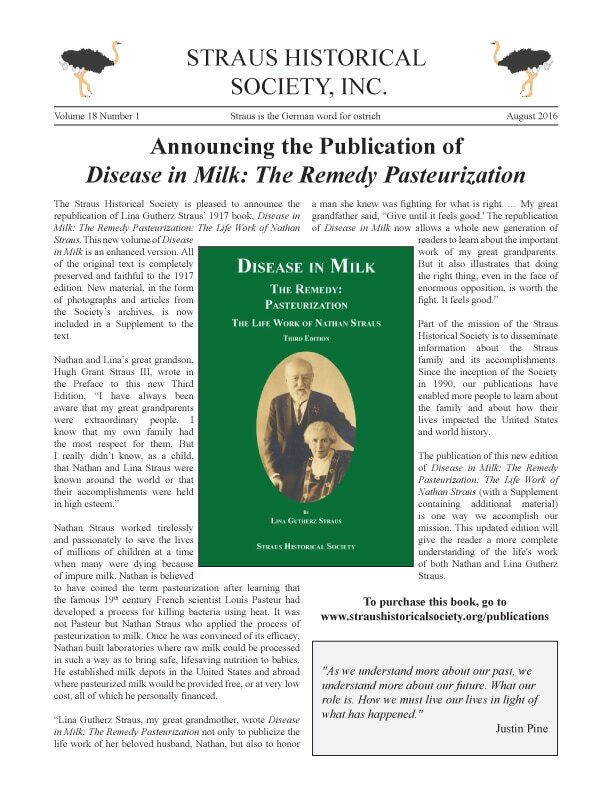 ​This newsletter contains an article announcing the publication of Disease in Milk: The Remedy Pasteurization, as well as articles about Letters by Theodore Roosevelt to Oscar S. and Roger Williams Straus and Anniversaries in Straus Family History. Smaller articles include The Percy Straus Play School, a New Look at Lazarus Straus, Recent SHS Programs and News from Friends of Straus Park. 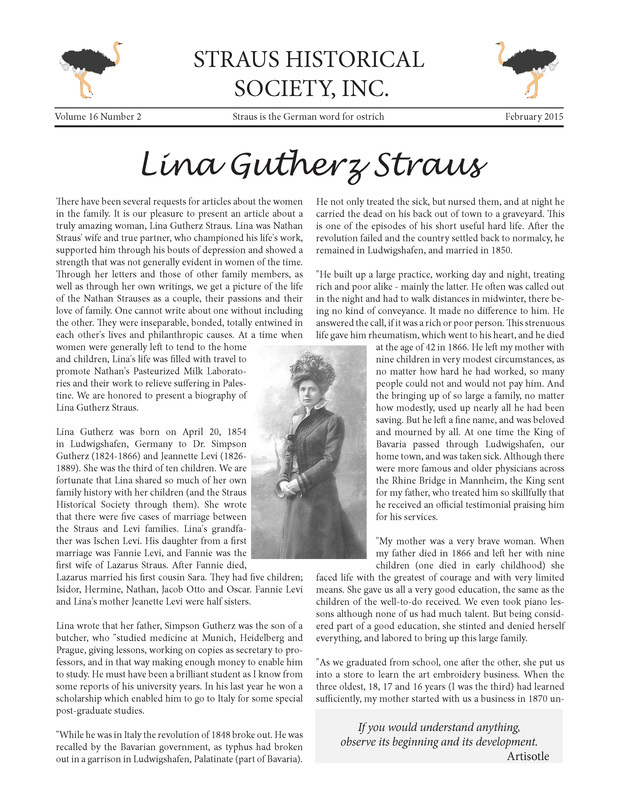 This newsletter contains an article about Lina Gutherz Straus, the wife of Nathan Straus. Smaller articles include New Additions to our Archives, the Woodlawn Cemetery Exhibit at Columbia University, SHS's Trips to Chicago and Georgia, The Straus Room at the Rutgers University Museum of Public Service, An Announcement for Oscar S. Schafer and an obituary of Nathan Straus III. 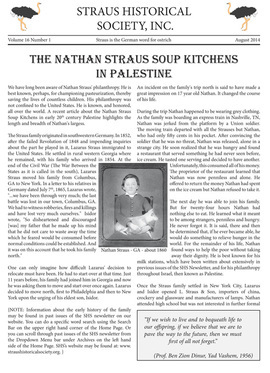 The August 2014 issue contains an article about the Nathan Straus Soup Kitchens in Palestine. Smaller articles include SHS's trip to Chicago in September 2014, the Isidor and Ida Straus Memorial Plaque Re-dedication, The Educational Alliance, a review of The Alzheimer's Diary, the Tuteur Family Reunion, and The Virtual Museum of Public Service. 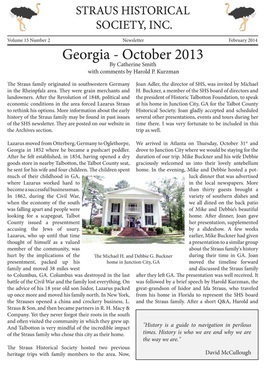 This newsletter contains articles about the SHS trip to Georgia in October of 2013 and The Straus family and the arts. Smaller articles include SHS's participation in the P.S. 198 Isidor and Ida Straus School's International Night, and the finding of the Lazarus Straus Naturalization Records. 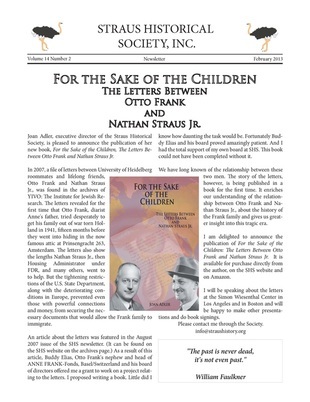 This newsletter contains articles about the publication of For the Sake of the Children by Joan Adler, the Nathan Roos Letters, the Nathan Straus Monument, and an article written by Yves-Marie Perion about Jesse I. Straus. 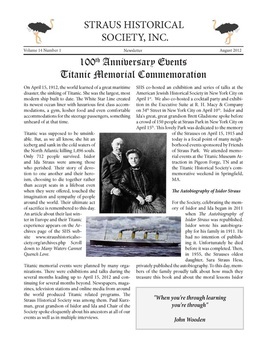 This newsletter contains articles about the 100th Anniversary Events Titanic Memorial Commemoration as well as a Speech by Brett Gladstone at Straus Park New York City - April 15, 2012: The 100th Anniversary of the Sinking of the Great Ship Titanic and "A Great Day in Straus Park" by Al Berr. 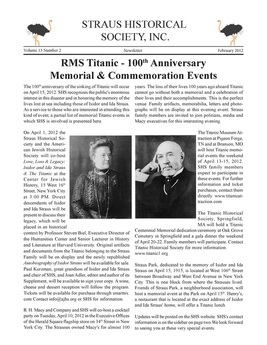 This newsletter contains articles about the RMS Titanic 100th Anniversary Memorial and Commemoration Events and the article "Many Waters Cannot Quench Love." 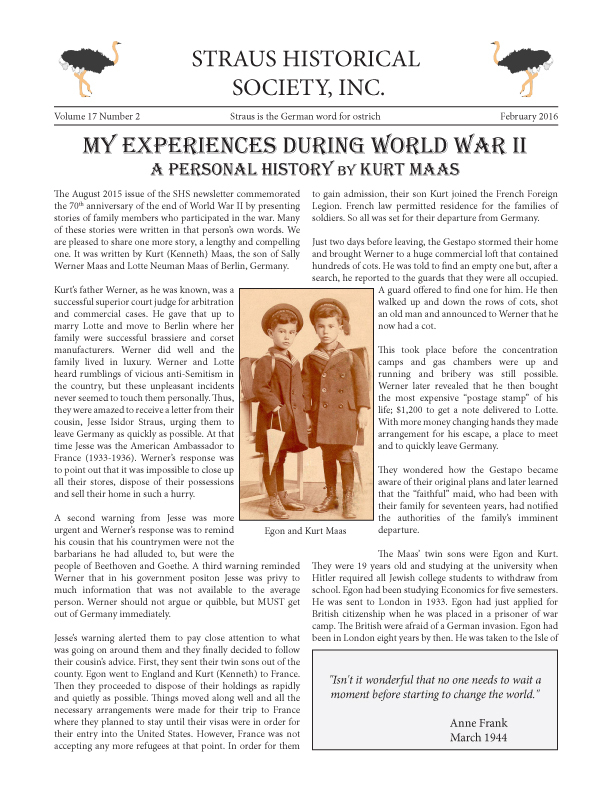 This newsletter contains articles about the republication of The Autobiography of Isidor Straus and about A Family Found: How I Found My Knoller Relatives. 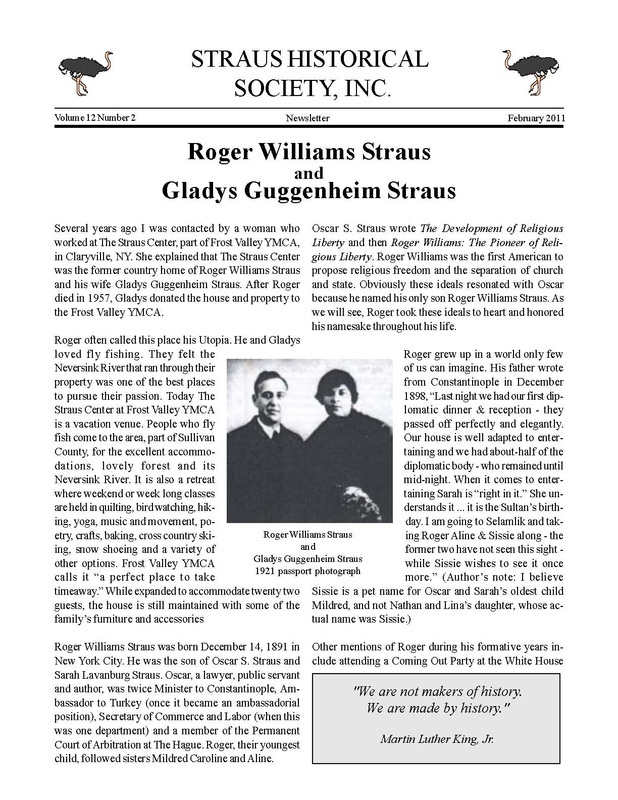 This newsletter contains an article about Roger Williams Straus and Gladys Guggenheim Straus and an article about The Last Letter Written by Ida R. Straus onboard Titanic. 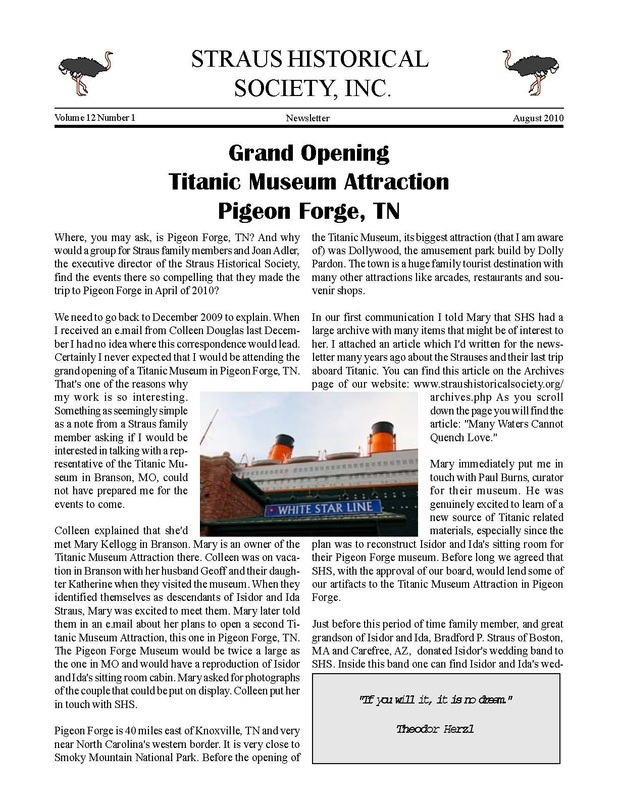 This newsletter contains articles about the grand opening of the Titanic Museum Attraction in Pigeon Forge, TN and about Middletown Farm, the Middletown, NJ country home of Herbert Nathan Straus and Therese Kuhn Straus. 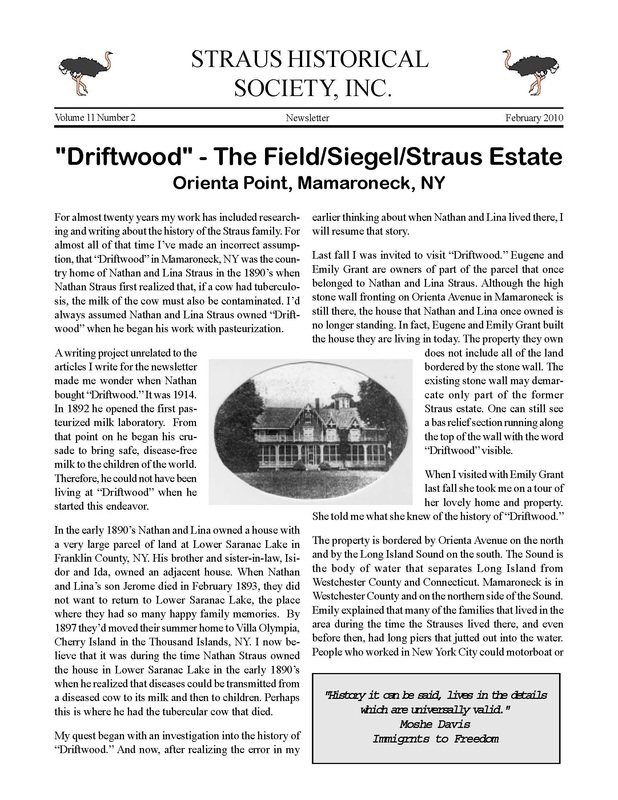 This newsletter contains articles about "Driftwood" - The Field/Siegel/Straus Estate at Orienta Point, Mamaroneck, NY and about Two Boys From England. 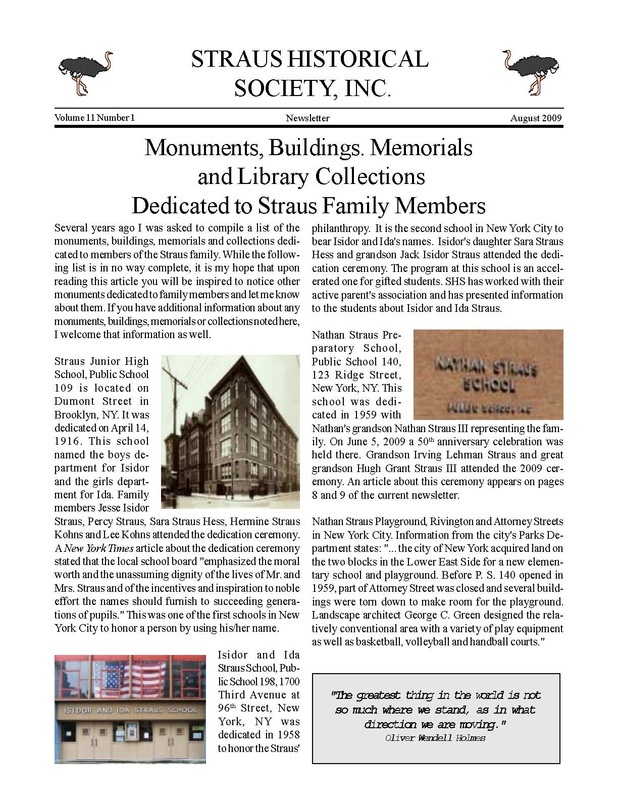 This newsletter contains an article about the various monuments, buildings, memorials and library collections dedicated to the Straus family. It also contains an article about the Nathan Straus Preparatory School, Public School 140 in New York City. 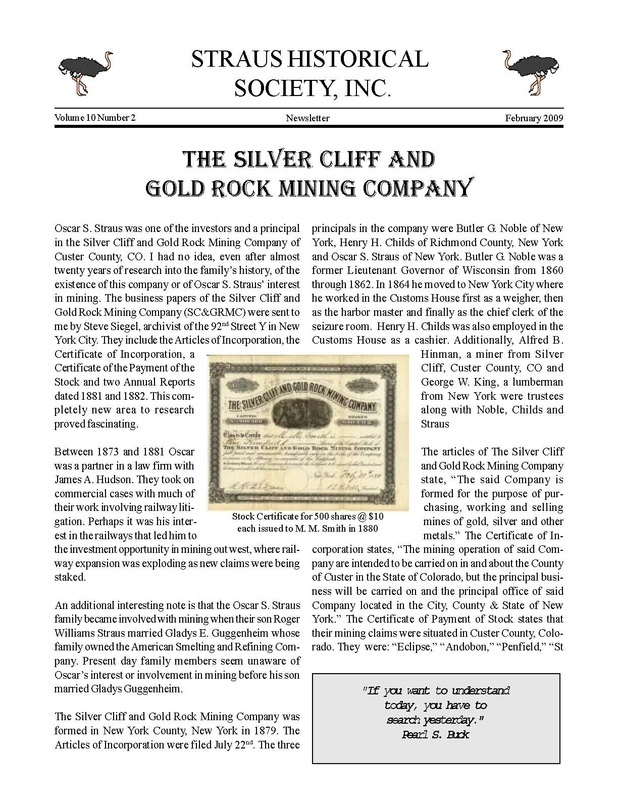 This newsletter contains articles about The Silver Cliff and Gold Rock Mining Company and about Cleveland Cottage. 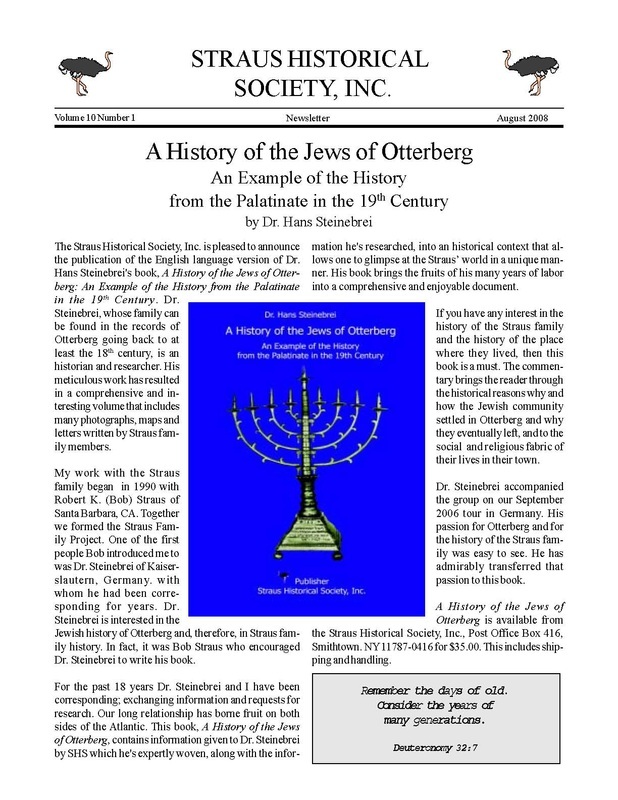 This newsletter contains an article about a video by Todd Weinstein and Steve Zehentner called Making Their Mark and an article about the farewell letters of Sara Straus written in 1854 when she was preparing to leave Germany. 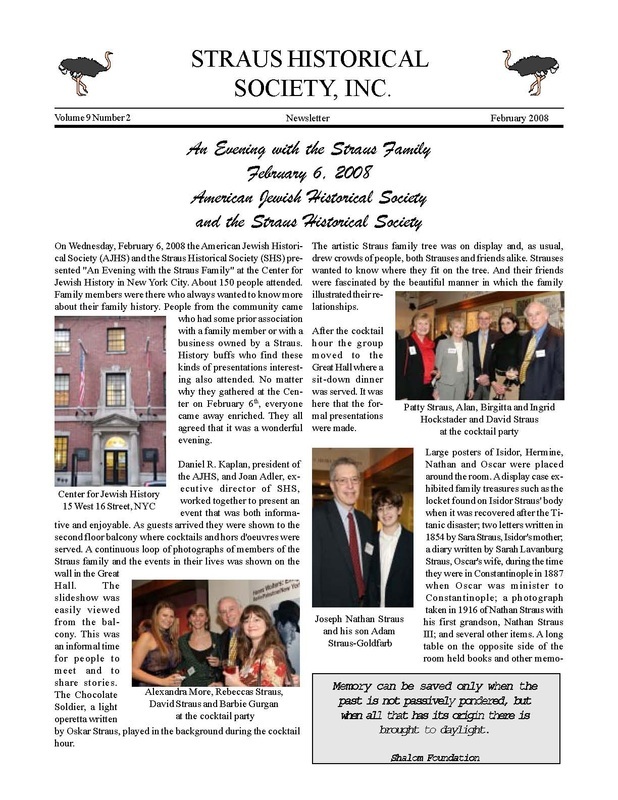 This newsletter contains an article about An Evening with the Straus Family at the Center for Jewish History and a memorial tribute to Donald Blun Straus. 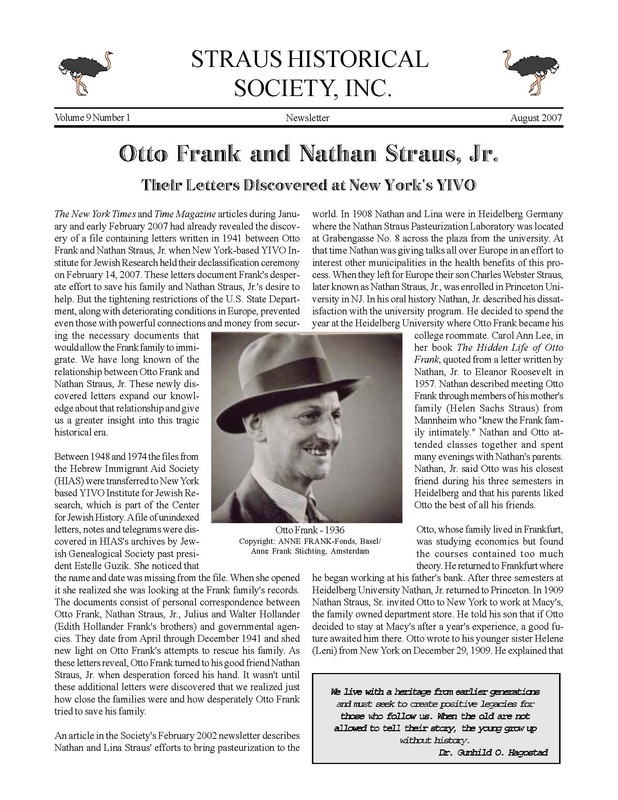 This newsletter contains an article about the newly discovered letters between Nathan Straus Jr. and Otto Frank and an article called Debunking "The Story." 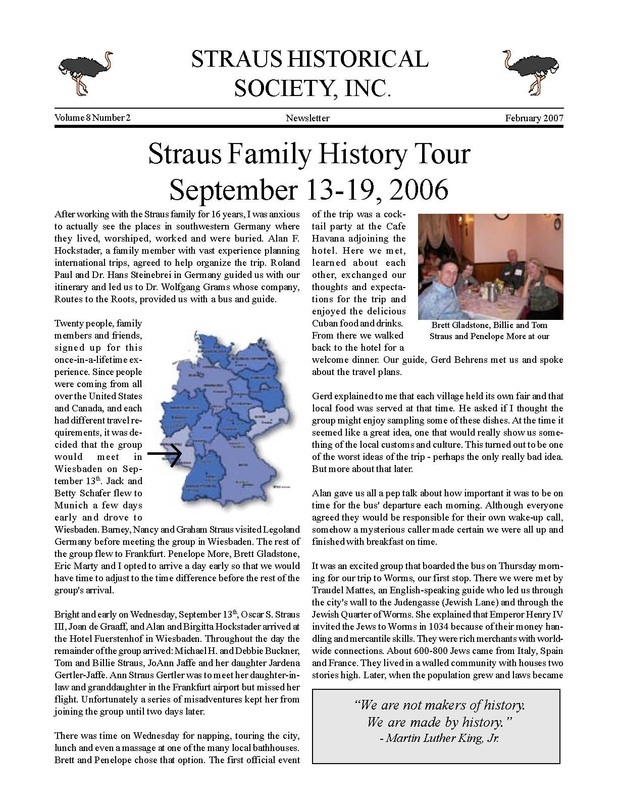 This newsletter contains an article about the Straus Family History Tour to Germany that took place September 13-19, 2006. 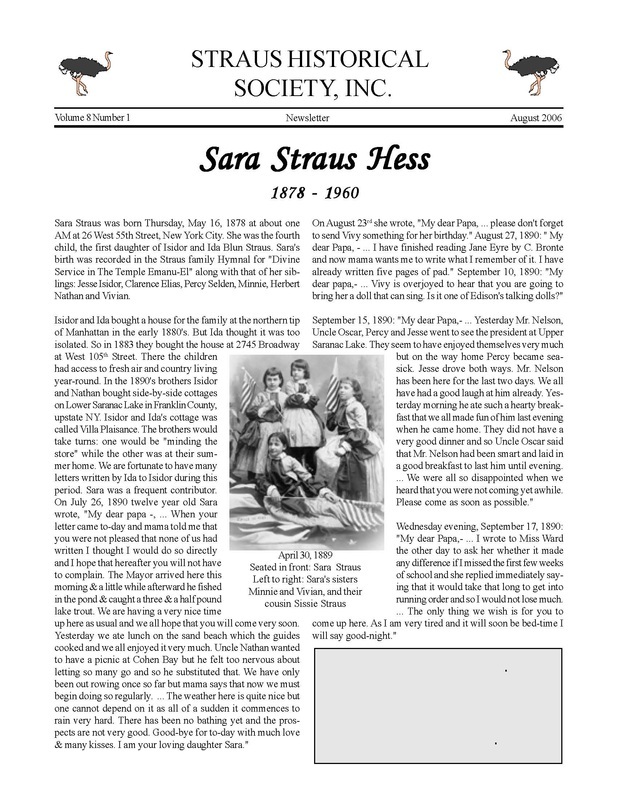 This Newsletter contains articles about Sara Straus Hess and a celebration of family members who survived the Holocaust. 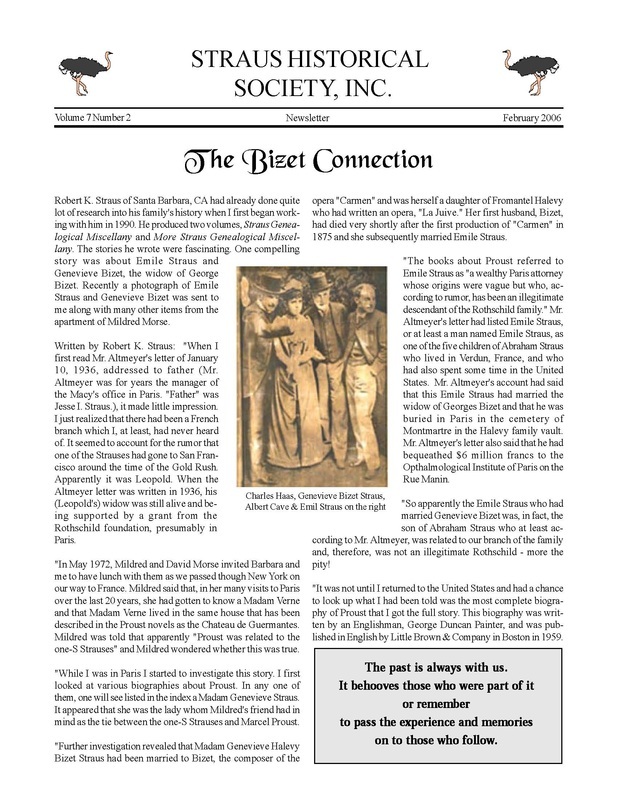 This newsletter contains articles about the Bizet connection to the Straus family and a memorial to family members who perished in the Holocaust. 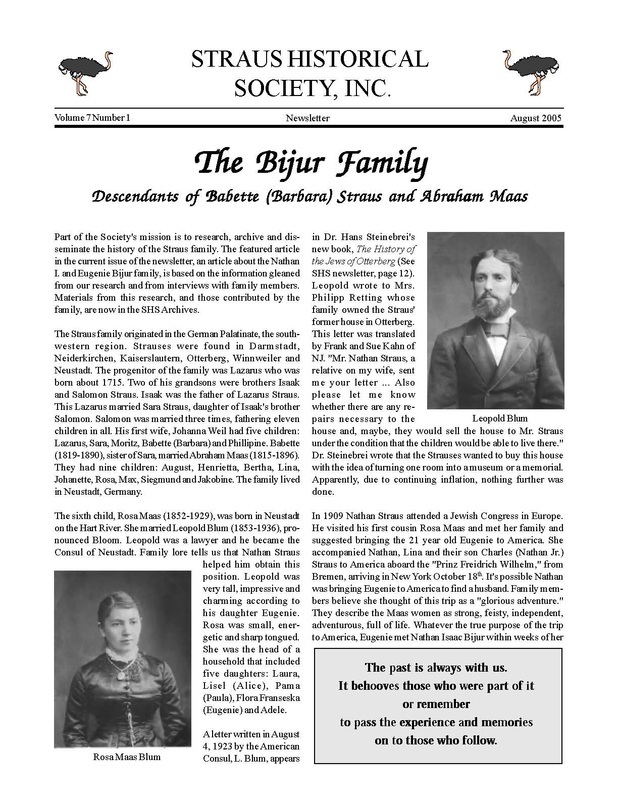 This newsletter contains an article about the Bijur family and another about Beile and Meir Moor, survivors of the Titanic disaster. 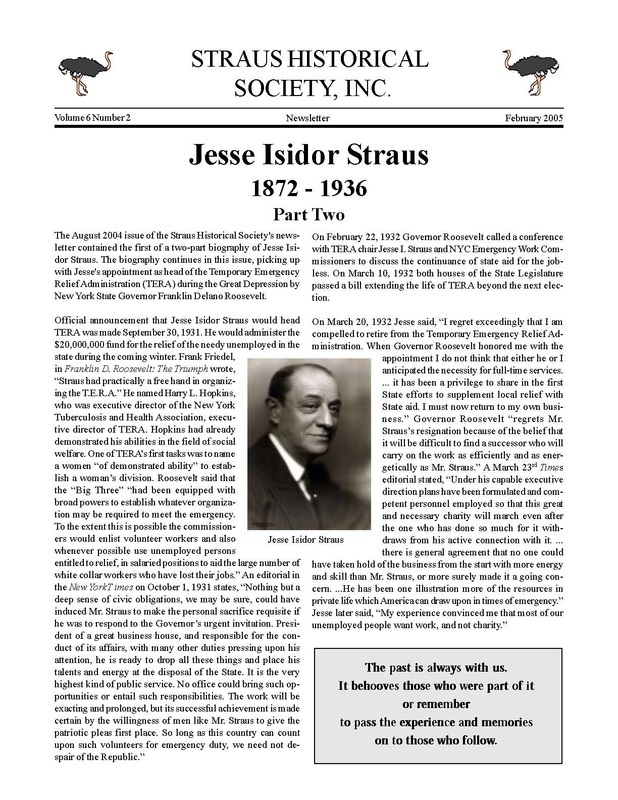 This newsletter contains part two of a biography of Jesse Isidor Straus 1872-1936 and an article about how one branch of the family came to America. 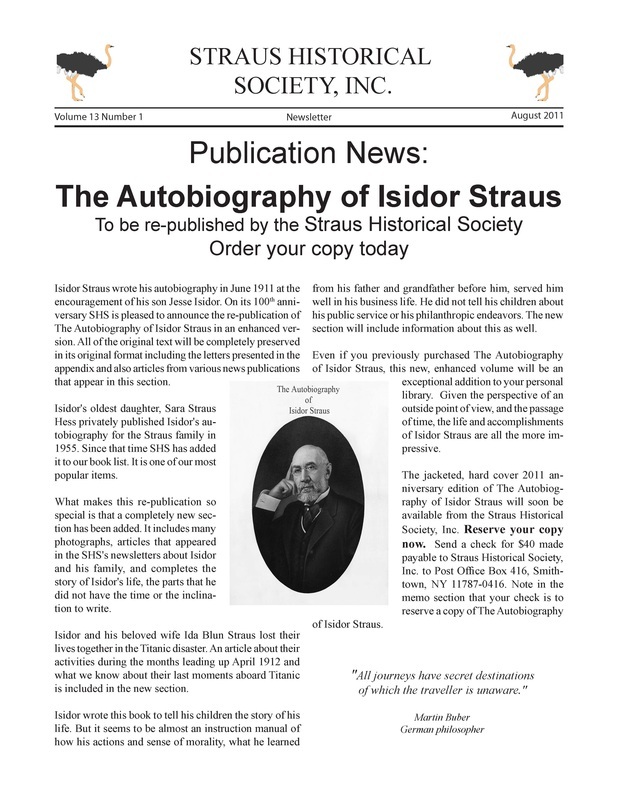 This newsletter contains articles about the new Straus Historical Society website and part one of a Jesse Isidor Straus biography 1872-1936. 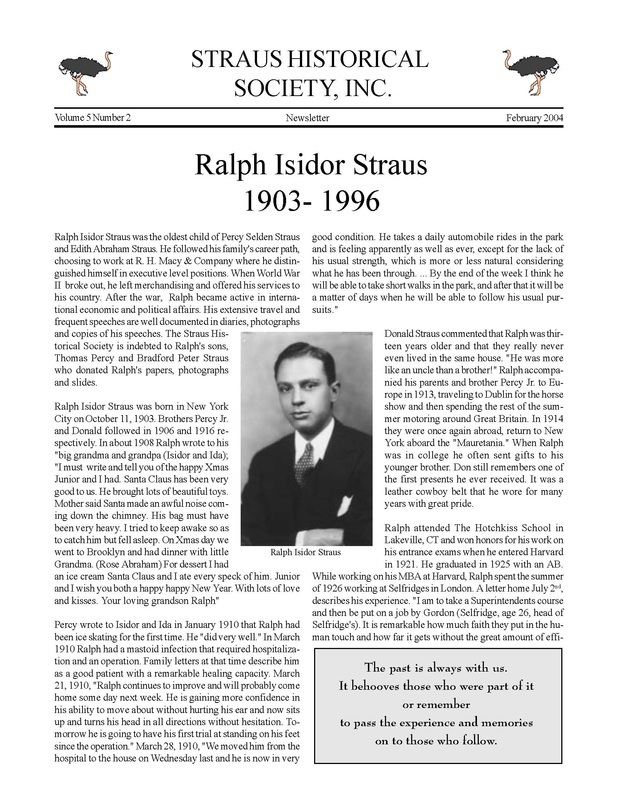 This newsletter contains a biography of Ralph Isidor Straus and an article about the Straus African Expedition of 1929. 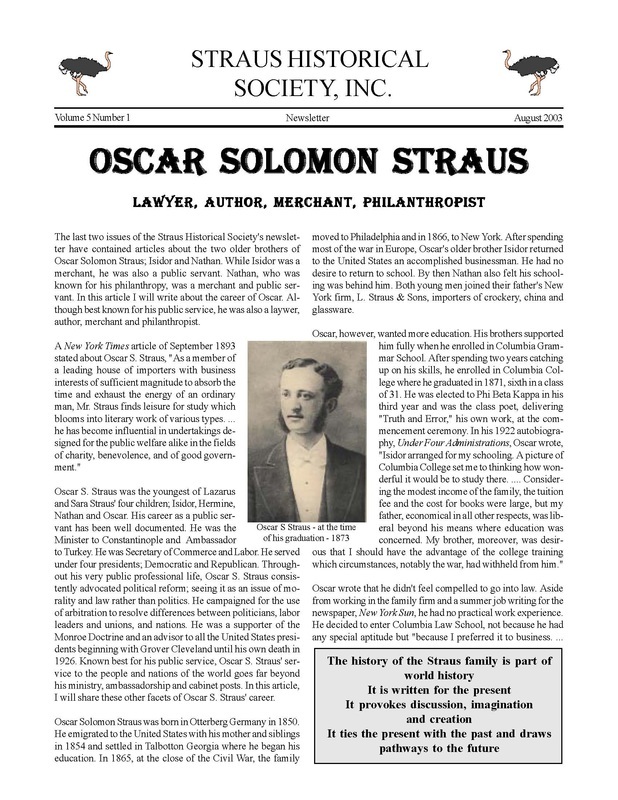 This newsletter contains a biography of Oscar Solomon Straus and a profile of Leonard Albert (Lee) Hockstader III. 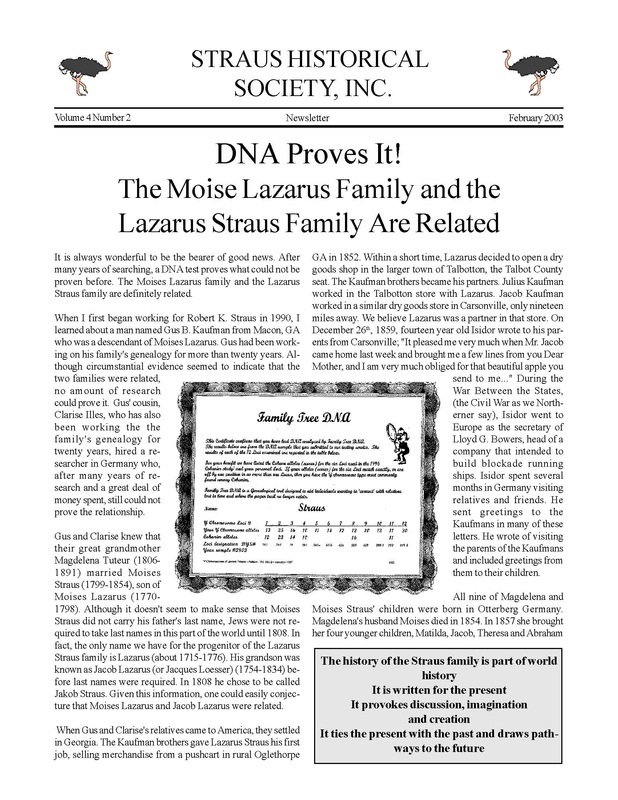 This newsletter contains articles about a DNA test to prove two branches of the Straus family are related and a biography of Nathan Straus. 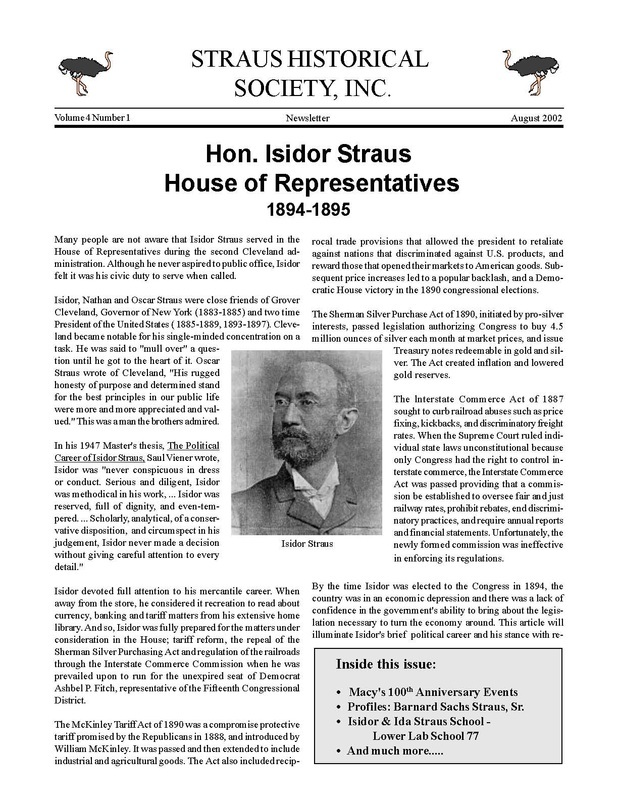 This newsletter contains articles about Isidor Straus in the House of Representatives and a profile of Barnard Sachs Straus, Sr. 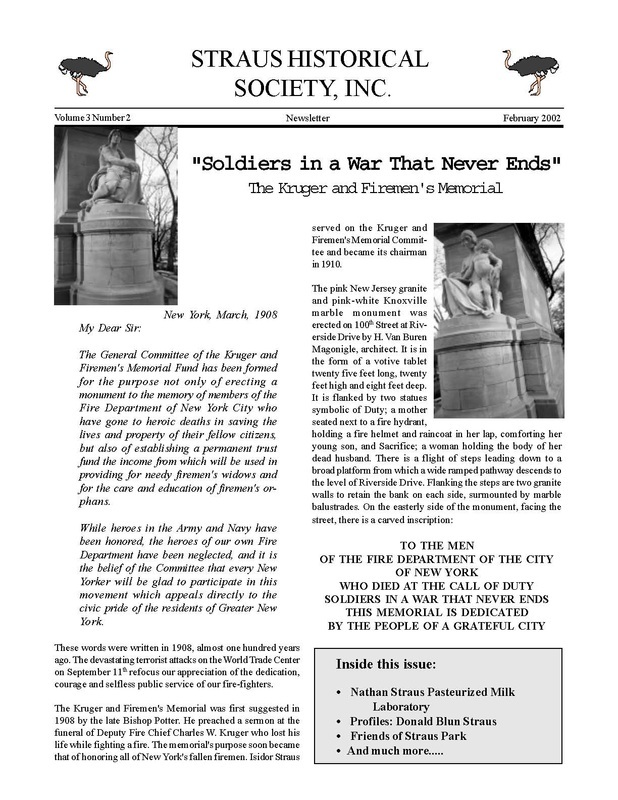 This newsletter contains articles about The Kruger and Fireman's Memorial and about the Nathan Straus Pasteurized Milk Laboratory. 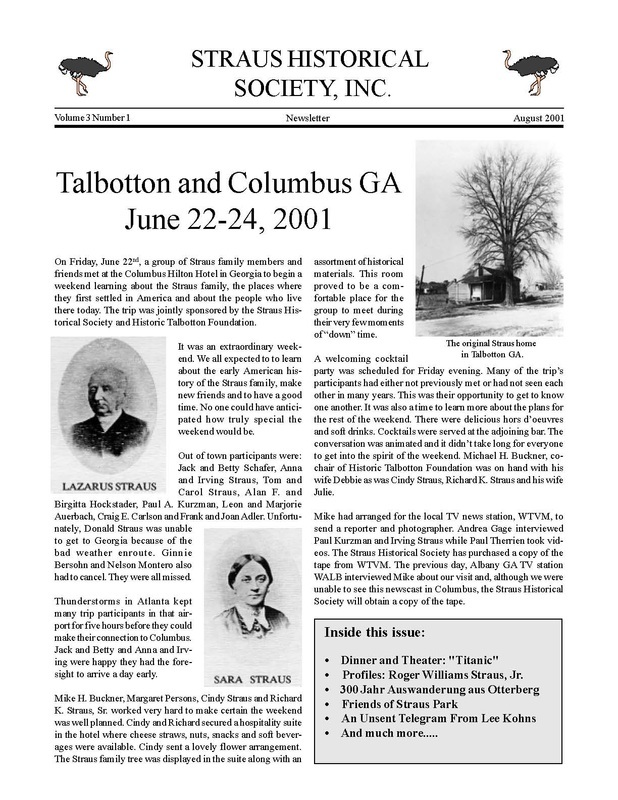 This newsletter contains articles about a SHS sponsored trip to Talbotton and Columbus GA June 22-24, 2001 and a profile of Roger Williams Straus, Jr. 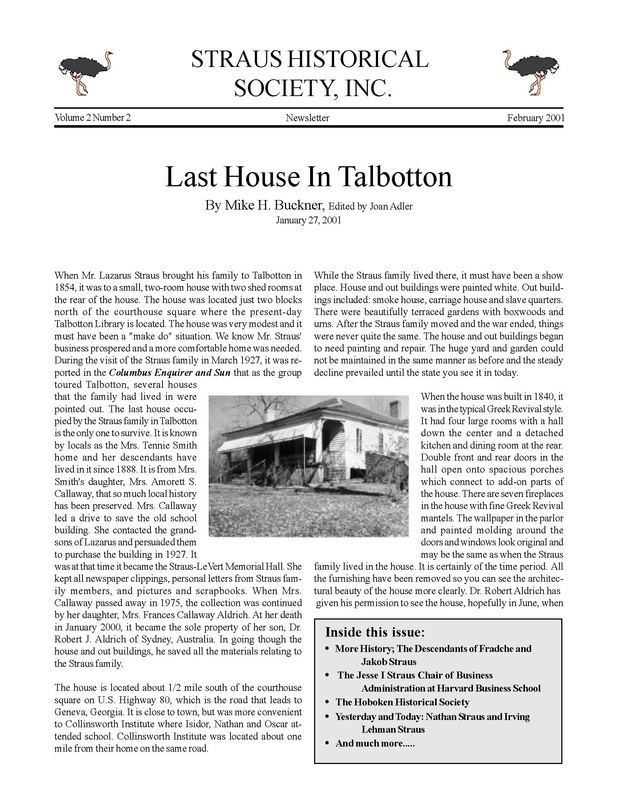 This newsletter contains articles about the Straus' last home in Talbotton, GA and a history of the descendants of Fradsche and Jakob Straus. This newsletter contains articles about The Origins of the Family Part Two, The Macy-Straus Cut Glass Catalog, and Friends of Straus Park. 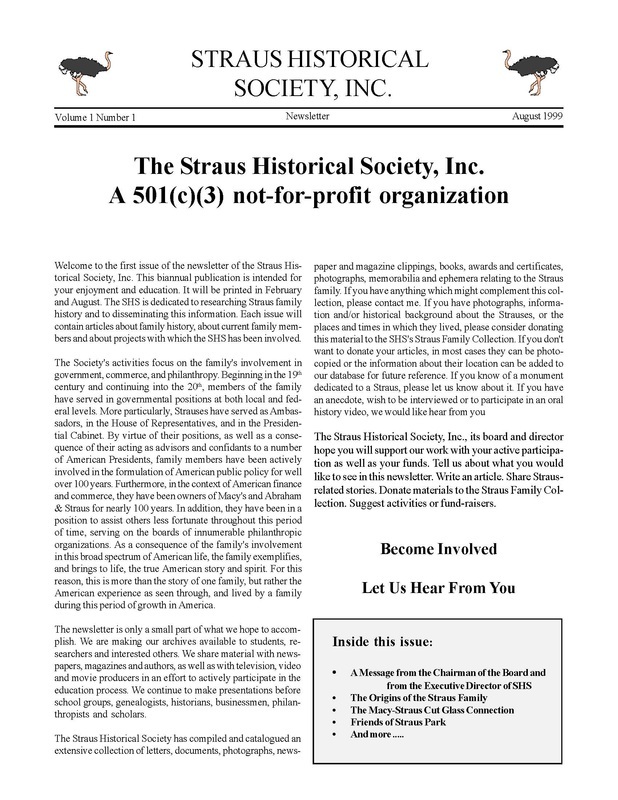 This newsletter contains articles about the newly formed Straus Historical Society, Inc. as a 501(c)(3) not-for-profit organization, The Origins of the Straus Family Part One, the Macy-Straus Cut Glass Collection and Friends of Straus Park. 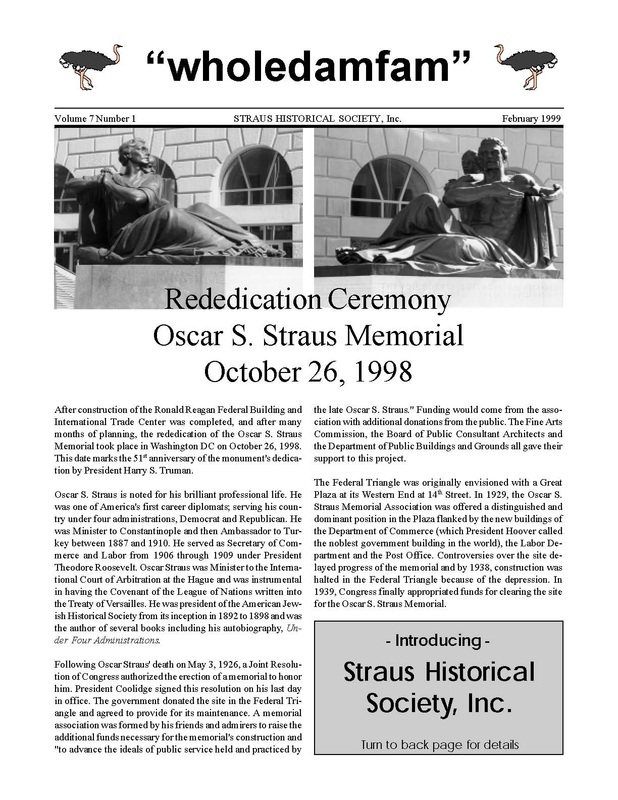 This newsletter contains articles about the Re-dedication of the Oscar S. Straus Memorial in Washington, D.C., Hermine Straus Kohns, The Maas and Altschuler Family, Billy Straus, Friends of Straus Park, the NYC Fourth Grade Curriculum, and the Kenneth H Straus Fire Fighting Collection. 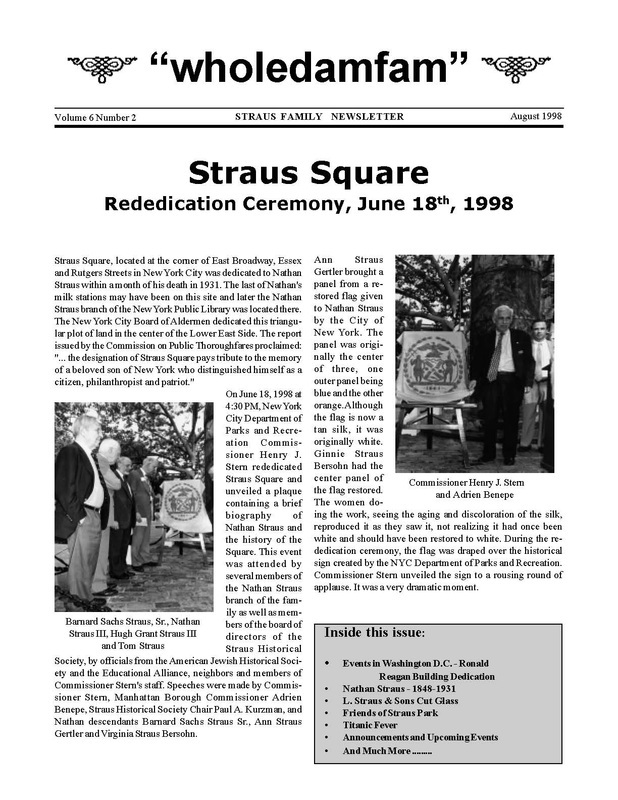 This newsletter contains articles about the Re-dedication of Straus Square, a square in New York City dedicated to Nathan Straus, Part Two of a biography of Nathan Straus, The Oscar S. Straus Memorial in Washington, D.C., L. Straus & Sons Cut Glass and Friends of Straus Park. 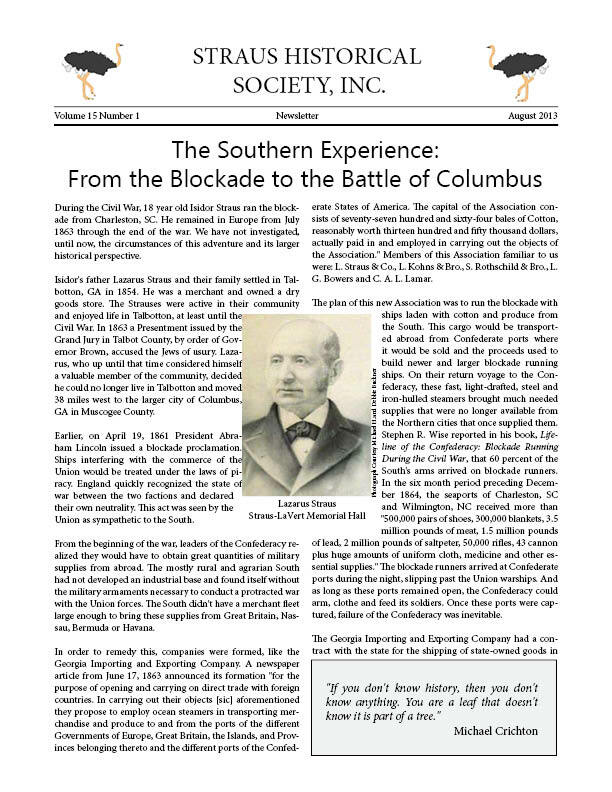 This newsletter contains articles about the Straus Historical Society's sponsored trip to Georgia, Part One of a biography of Nathan Straus, Friends of Straus Park, and the Titanic Movie. 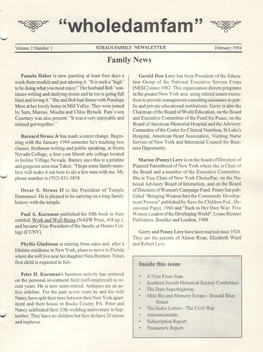 This newsletter contains a memorial to Robert K. Straus and articles about the Re-dedication of Straus Park in New York City, the Oscar S. Straus Memorial in Washington, D.C., The Nathan Straus Park, Monuments and Memorials to the Strauses, the Straus Family visit to Talbotton, GA, and Friends of Straus Park. 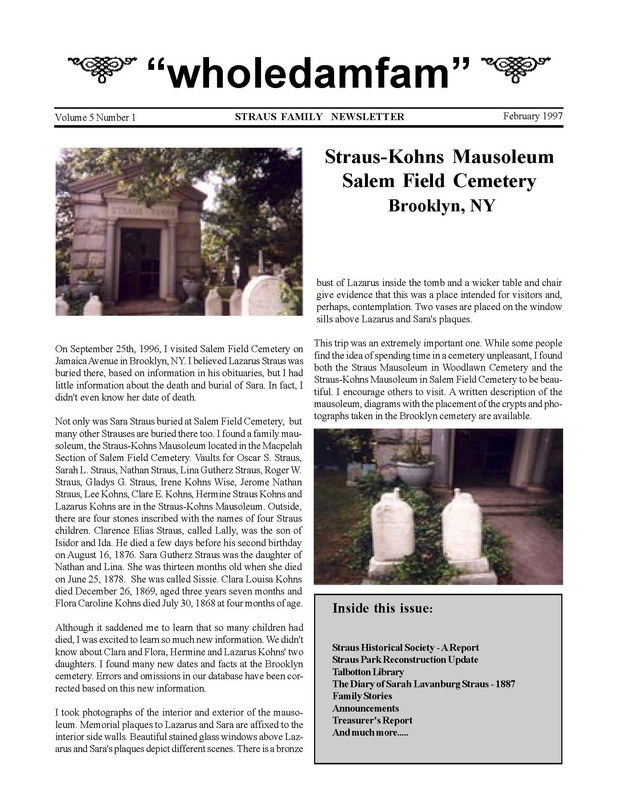 This newsletter contains articles about the Straus-Kohns Mausoleum in Salem Field Cemetery in Brooklyn, NY, a biography of Sarah Lavanburg Straus, the Talbotton Library, the Straus Park Reconstruction Update, Titanic: the Musical as well as a tribute to Edward Kuhn Straus. 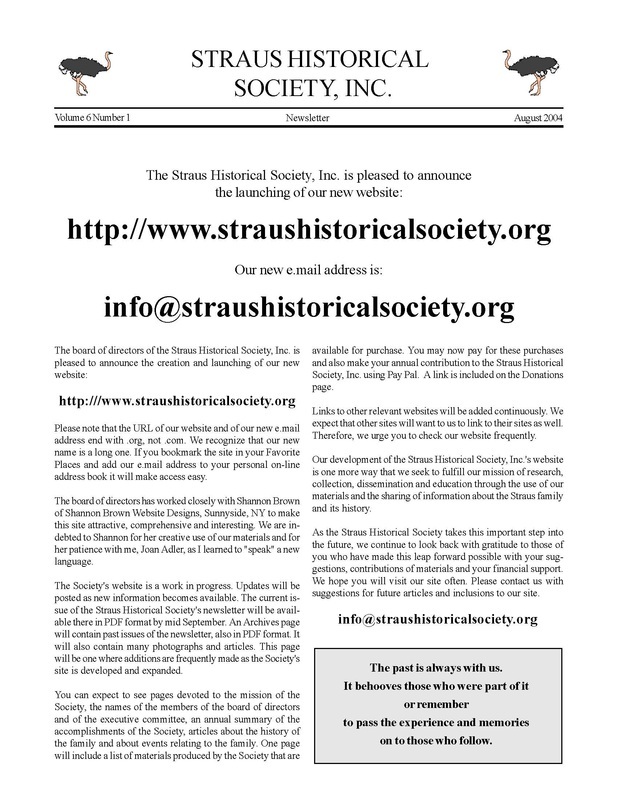 This newsletter introduces the Straus Historical Society and explains its formation and its goals as well as announcing the creation of the Straus Family Tree. 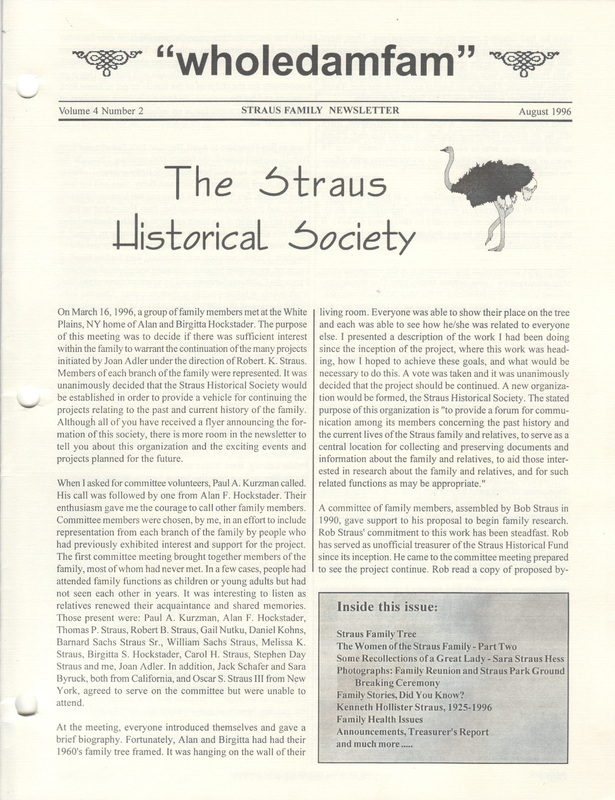 Additional articles are: The Women of the Straus Family - Part Two, Some Recollections of a Great Lady - Sara Straus Hess, and a tribute to Kenneth Hollister Straus. 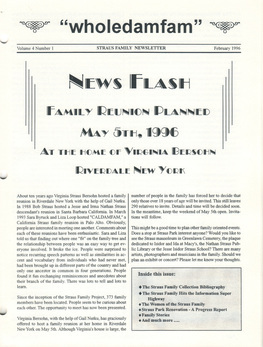 This newsletter announces plans for a Straus family reunion in New York. 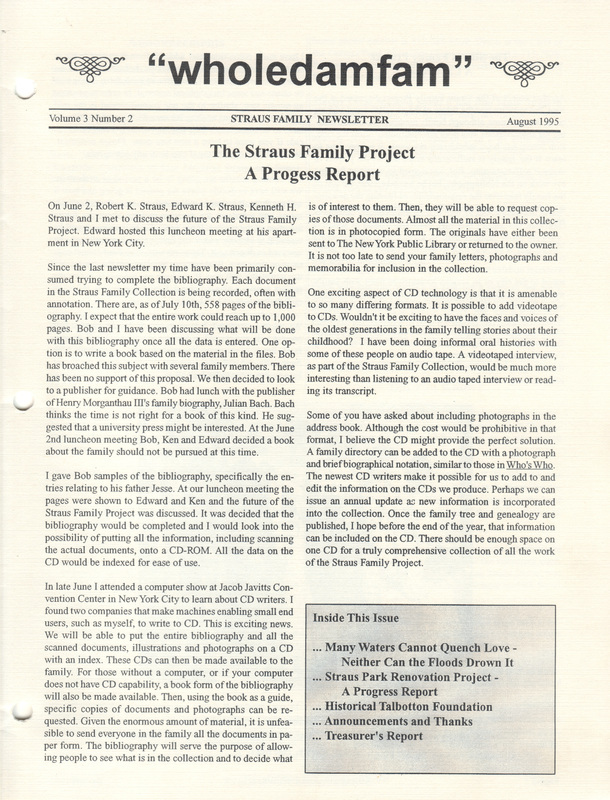 Additional articles are: The Women of the Straus Family and Straus Park Renovation - A Progress Report. 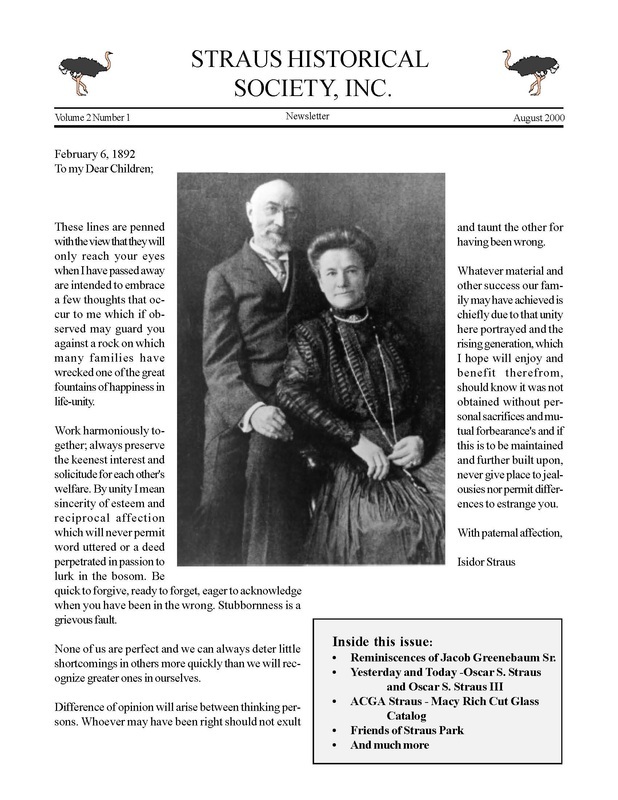 This newsletter contains articles about The Straus Family Project: A Progress Report, Many Waters Cannot Quench Love - Neither Can the Floods Drown It, the story of Isidor and Ida Straus and the last year of their lives including their Titanic experience as well as an update on the Straus Park Renovation and the Historic Talbotton Foundation. 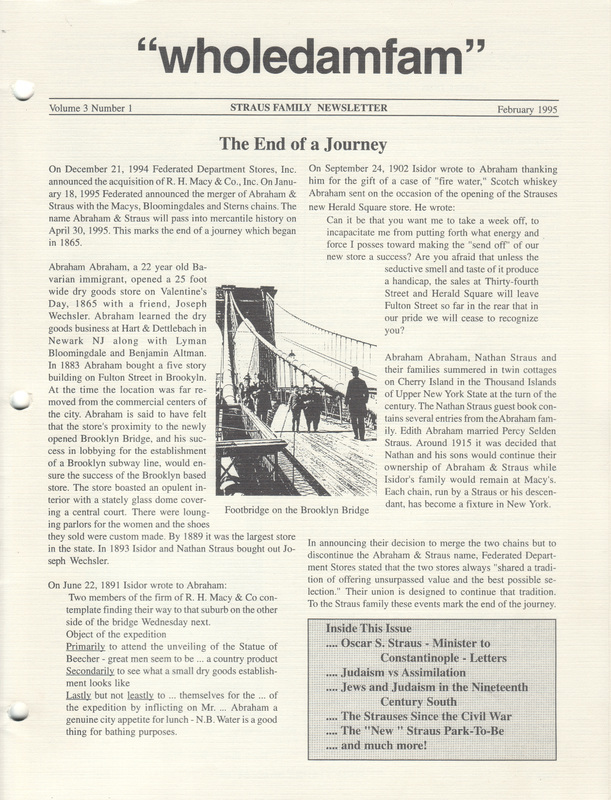 This newsletter contains articles about the closing of Abraham & Straus, a family owned business, a continuation of the article Oscar S. Straus: Minister to Constantinople - Letters, the Renovation of Straus Park, and the Strauses Since the Civil War. 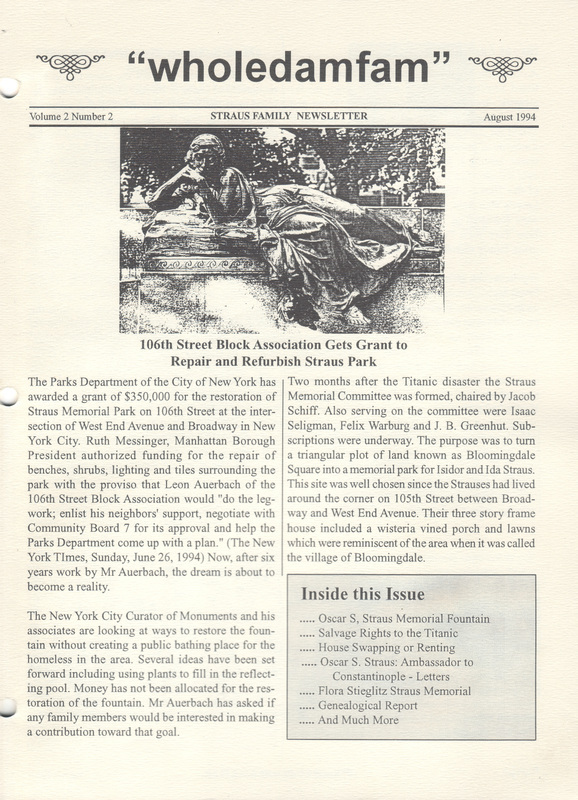 This newsletter contains articles about the 106th Street Block Association Grant to Repair and Refurbish Straus Park, Oscar S. Straus: Ambassador to Constantinople - Letters, and a Celebration of Flora Stieglitz Straus. 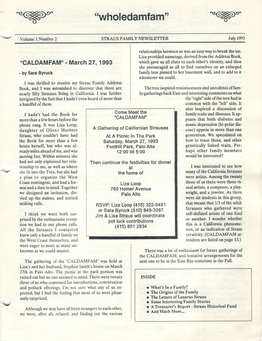 This newsletter describes a family reunion held in CA called "CALDAMFAM." 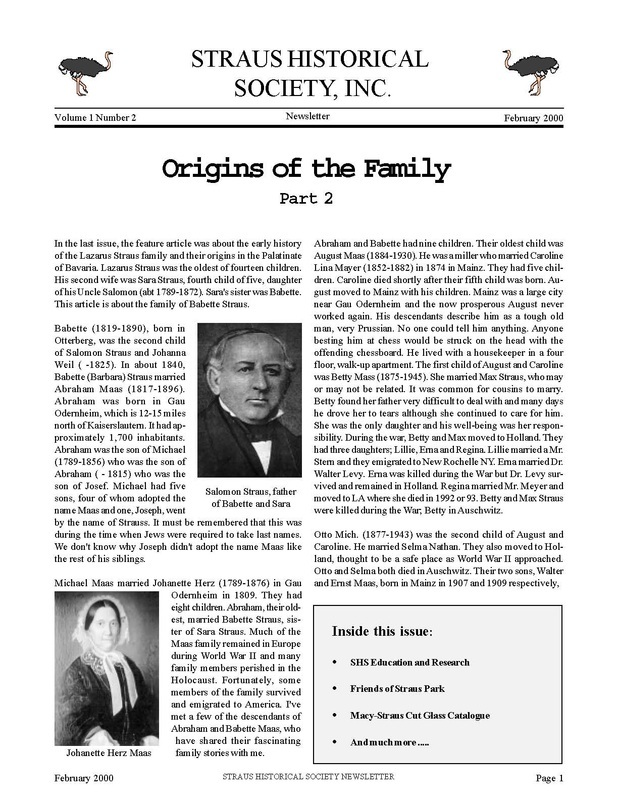 Additional articles are: What's in a Family? and The Origins of the Family. 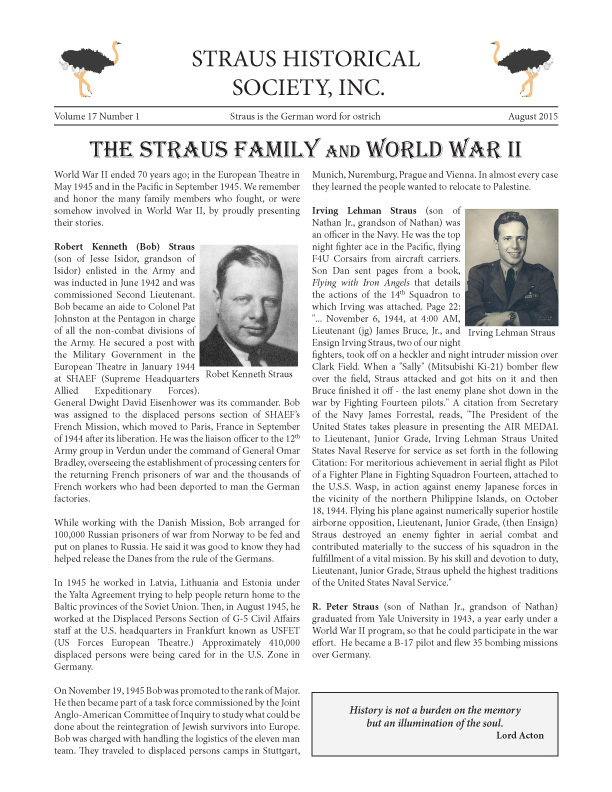 This is the first issue of the Straus family's newsletter. 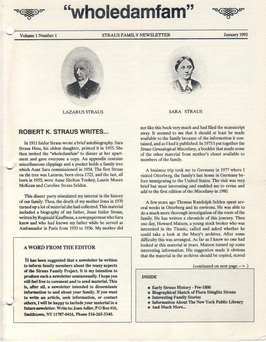 It was written before there was a Straus Historical Society. 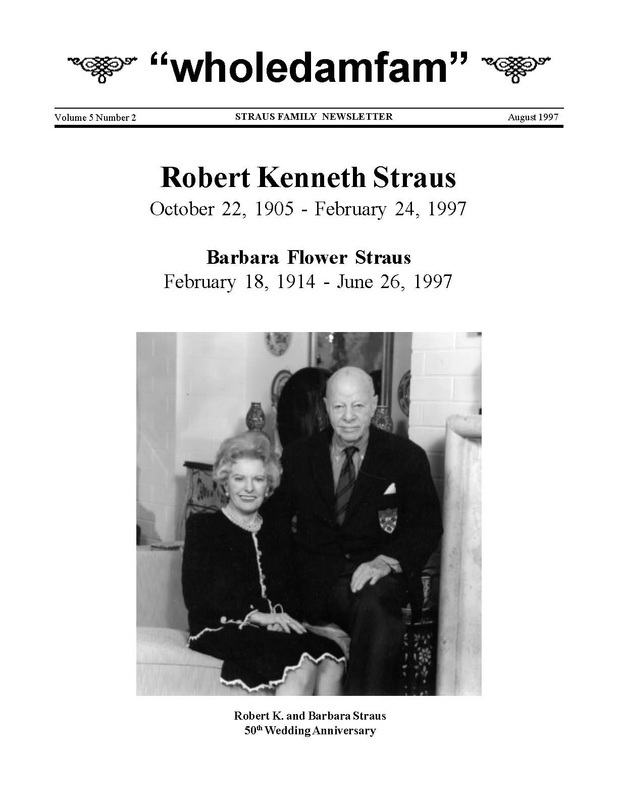 Its purpose was to introduce a project initiated by Robert K. Straus of Santa Barbara, CA and to get Straus family members interested in his project. The articles explain the inception of the project, give a brief overview of the origins of the family and presents a brief biography of Flora Stieglitz Straus.